Thinking of becoming an Eagle? Why you should go to Preview Day. 1. Preview Day provides prospective AU students and their families with a taste of AU. After reading through promotional materials, it's worth getting the authentic, firsthand AU experience. 2. Explore AU's beautiful, thriving campus. Take a campus tour led by current AU student ambassadors - many of whom decided to come to AU when they came to Preview Day. This spring, AU became the first university in the US to achieve carbon neutrality. And another fun environmental fact? AU's entire campus is a designated arboretum. 3. It tells AU's Office of Admissions that you are interested, which could be beneficial when you apply. AU's admission evaluation process factors in a student's level of interest. A campus visit is the best indication. 4. Learn more about AU's academic programs. During the Academic Overview sessions, students get the low-down on one of six AU schools of their choice: the College of Arts and Sciences, the Kogod School of Business, the School of Communication, the School of Education, the School of International Service, and the School of Public Affairs. 5. Hear directly from current AU students about what it's really like to be an AU student - without your parents. 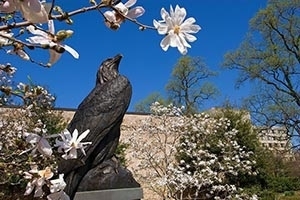 Ask any question during the "Life as an Eagle" for-students-only session. 6. See our augmented reality posters. These signs come to life with the Tour AU app. Can you find all four posters on campus? 7. Find out if one of AU's signature first-year programs would be right for you. Learn about AU's most rigorous academic programs and living-learning communities: the Frederick Douglass Distinguished Scholars, AU Honors, and the Community-Based Research Scholars. 8. During the Student Life Fair, get more information about the residence halls, dining plans, student activities, and how you can become a member of the Blue Crew. Also learn about study abroad, opportunities to engage in service projects, the University Library, and numerous other campus offices that provide social, spiritual, health, or academic resources for students. 9. Meet admissions experts. Also, investigate options to help finance your education. 10. It's free! There is no charge to participate. Even breakfast and lunch are free.